It's now 61 days until kickoff of Catamount football at Western Carolina's E.J. Whitmire Stadium. The Catamounts open the season on Thursday, August 30, 2012 against Mars Hill College. Chris Collins joined the Western Carolina coaching staff as a Defensive Assistant prior to the spring drills in 2011 after spending the previous year as a student assistant during the 2010 season. He has worked primarily with the linebackers, a position he played for the Catamounts during his collegiate career, and under new head coach Mark Speir will assist with the defensive secondary. Collins, a four-year letterwinner, closed his careeer by being named All-Southern Conference by the voting members of the SoCon Sports Media Association (SCSMA) as a senior after tallying a career-high 109 tackles including 63 solo stops. He added 12.5 tackles for loss playing the "hybrid" linebacker position in WCU's 4-2-5 scheme. Through 44 career games, the High Point, N.C., native finished with 303 career hits including 166 solo tackles and 19 tackles for a combined 93 yards in losses. A ball-hawk, Collins finished with nine forced fumbles with a SoCon-leading six coming during his junior season. He was also credited with five pass break-ups. Collins played in 10-or-more games in each of his four seasons in Cullowhee. Off the field, Collins was named to the 2007 Fall Academic All-Southern Conference team. Eugene, OR - Former WCU standout track athlete Manteo Mitchell ran in the fifth and final heat in the opening round of the 200m dash at the Olympic trials. Mitchell placed second in his heat, with a personal best of 20.47, just behind heat winner Isiah Young at 20.38. Mitchell now advances to Saturday’s semifinals at 9:00 p.m. ET. Mitchell will need to finish in the top eight to advance to Sunday’s finals. Again, the top three finishers in the final advance to London to represent the US in the Olympics. Semifinals: 9 p.m. Saturday (NBC). Finals: 7:50 p.m. Sunday (NBC). Good Luck from the entire Catamount Nation. "Catamount 101: Ladies Love Football"
Cullowhee, N.C. - "Catamount 101: Ladies Love Football" a preseason clinic is scheduled for Saturday, Aug. 11 in conjunction with the annual Catamount Club Tailgate Kickoff event on campus. Catamount 101 is an opportunity for female Catamount fans to increase their football knowledge, and Head Coach Mark Spiers invites them to enjoy a festive day of football and fun. The clinic starts at 10:30 am at Whitmire Stadium. There is a registration deadline of Friday, July 27, with a cost is just $35. For more information or to register for the fun-filled event, contact WCU Athletics Director of Marketing, Lindsey Lessing by E-mail at lalessing@wcu.edu or call (828) 227-2655. Eugene, OR - Western Carolina's Manteo Mitchell will be running again against Olympic gold medalists today. Just five days after placing fifth in the 400 meter, he’ll try his hand at the 200 meter dash, at the U.S. Olympic trials in Eugene Oregon. “I have so much confidence in myself after that race on Sunday that I feel like a completely new athlete in the same body. My mindset is on nothing but GOLD! I feel that I can compete in the half lap just as I did with the full one.” said Mitchell in an email to the Asheville Citizens Times. It's now 62 days until kickoff of Catamount football at Western Carolina's E.J. Whitmire Stadium. The Catamounts open the season on Thursday, August 30, 2012 against Mars Hill College. Today we'll continue to highlight the offensive line. 2011 (Redshirt Junior): Saw action in all 11 games making 10 starts along the offensive line including eight at right tackle and once at right guard ... Helped freshman running back Shaun Warren rush for 200 yards and four touchdowns against Mars Hill. 2010 (Redshirt Sophomore): Played in all 11 games on the season making 10 appearances among the starting lineup on the offensive front at left tackle ... Was tabbed the squad's offensive MVP following the game against Georgia Southern. 2009 (Redshirt Freshman): Started all 11 games along the offensive front - one of two redshirt freshmen to do so ... Helped Southern Conference Freshman of the Year Michael Johnson tally two, 100-yard rushing games against nationally-ranked foes, Appalachian State and Elon ... Pushed the pile up front to allow WCU to record 10 rushing touchdowns, the most scores on the ground since 2007 ... Did not dress for WCU's annual Spring Game. 2008 (Freshman): Redshirted. Prior to Western: As a senior, graded out as a team-best 88-percent blocker ... Earned second team All-State accolades, as well as All-Area, All-Region and All-North Georgia honors in his final year as a prep ... Helped Whitfield HS finish ranked 10th in the final AP AAAA rankings and tie for the winningest class in school history. WCU graduate Harouna Mutombo hopes to hear his name in tonight’s NBA draft. Mutombo has worked out with five NBA teams in recent weeks (Toronto, Houston, Atlanta, New York and Indiana), in hopes of impressing at least one team, that results in his being drafted. “I just went in there and showed my competitiveness. I shot the ball really well. I think a lot of teams have been questioning if I could shoot the ball. I didn’t get a chance to show that too much in college, but that’s the main thing: me shooting the ball well.” said Mutombo. The NBA draft will be broadcast tonight at 7:30 p.m. on ESPN. It's now 63 days until kickoff of Catamount football at Western Carolina's E.J. Whitmire Stadium. The Catamounts open the season on Thursday, August 30, 2012 against Mars Hill College. Eugene, OR - Western Carolina's Manteo Mitchell will be running again against Olympic gold medalists this weekend. Just five days after placing fifth in the 400 meter, he’ll try his hand at the 200 meter dash, this Friday at the U.S. Olympic trials in Eugene Oregon. Spartanburg, SC - Only one year into a three year deal with public television stations to show the SoCon Football "Game of the Week", the Southern Conference has withdrawn from it's deal with NC, SC, & Georgia public television networks. The SoCon was unable to reach an agreement with the PBS stations in Alabama and Tennessee to show the "game of the week" statewide in those states. The conference wanted the SoCon weekly games televised statewide in all five states, therefore, withdrew from the agreement completely. Now that the SoCon is without any television deal, the SoCon "Game of the Week" can be seen only on ESPN3. "Our TV package will be solely and exclusively with ESPN this year," SoCon commissioner John Iamarino said. "It became apparent that we were not going to be able to put together the kind of coverage that we would need to continue with the public television model." At this time, eight SoCon football games are scheduled to be shown this fall on ESPN3, as well as other events later in the year. All of the men's basketball tournament and the semifinals and the title game of the women's tournament are part of the SoCon enhanced agreement with ESPN3 announced earlier. It's now 64 days until kickoff of Catamount football at Western Carolina's E.J. Whitmire Stadium. The Catamounts open the season on Thursday, August 30, 2012 against Mars Hill College. It's now 65 days until kickoff of Catamount football at Western Carolina's E.J. Whitmire Stadium. The Catamounts open the season on Thursday, August 30, 2012 against Mars Hill College. 2011 (Redshirt Junior): Started all six games in which he saw action at right guard before suffering a season-ending knee injury at Chattanooga ... Underwent off-season surgery and spent the spring in rehabilitation with an anticipated return in the fall of 2012 ... Credited with one tackle following a turnover against Furman. 2010 (Redshirt Sophomore): Started all 11 games along the offensive front including eight at center and three at left guard ... Learned a new position during 2010 spring drills, taking over at center ... Was one of only two players on the team to start and play in all 11 games on the season. 2009 (Redshirt Freshman): Started all 11 games along the offensive front - one of two redshirt freshmen to do so ... Helped Southern Conference Freshman of the Year Michael Johnson tally two, 100-yard rushing games against nationally-ranked foes, Appalachian State and Elon ... Pushed the pile up front to allow WCU to record 10 rushing touchdowns, the most scores on the ground since 2007. 2008 (Freshman): Redshirted. Prior to Western: Was an All-Northwestern 4-A lineman as a senior ... Also garnered Offensive Lineman of the Year accolades in his final season as a prep ... Played for head coach Jason Watson at Freedom HS. Personal: Is the son of Teddy Rhoney, Jr., and Teresa Puett ... Has two siblings, Nikki and Amy. For those wanting a quick conformation from the CAA of new members joining the league, you just might have a little wait ahead of you, according to Gary Miller, the chancellor of UNCW (& recently named chairman of the CAA's Council of Presidents). It will probably be around Christmas before any announcement from the CAA on new members. In an article in Star News Online, Miller is quoted as saying, "The presidents work as a fairly cohesive committee. We have our views and express them, but we can reach consensus. I'll help that process by organizing discussion and then help the commissioner when it's time for potential members." "Christmas is a realistic goal," he said of a time frame to announce new members. Read the Star News article here. Cullowhee, NC - It's now 66 days until kickoff of Catamount football at Western Carolina's E.J. Whitmire Stadium. The Catamounts open the season on Thursday, August 30, 2012 against Mars Hill College. Prior to Western Carolina: Transferred to WCU during the summer of 2011 after two seasons at Palomar College in California ... Suffered an injury during a preseason scrimmage in 2008 that sidelined him for entire season ... Returned to play two seasons along the offensive line for the Comets; At Vista Murrieta HS: Named All-Southwestern League selection under coach Coley Caneal ... Was selected as Athlete of the Month ... Also particiapted in track & field as a prep. Personal: Full name is Steven Phillip Steiner ... Born in San Bernardino, Calif. ... Is the son of Tammy Green ... Has two sisters, Avi and Captri Steiner. Eugene, OR - Manteo Mitchell ended up with the fifth best time of 44.96 in the finals of the 400 meter dash at the US Olympic trials, just two spots and 0.16 seconds from qualifying individually in the 400 meter. However, as one of the top six finishers, he qualified for this year’s US Olympic Team as part of the 4x400-meter relay team. Now that his Olympic ticket to London has been punched, he’s not done yet. Mitchell is now looking ahead to this Friday, when he will participate in the 200-meter Olympic Trials, also in Eugene, Oregan. Asheville, NC - On Thursday, Ross Heffley suited up for a baseball game. However, he was not in his familiar Catamount uniform this time, but now in one with a Braves' logo. Heffley's debut as a Rome Brave was a good one, especailly in the eyes of his new manager. The game was almost a homecoming for Heffley, with his family in the stands, and playing in a familiar stadium. Ross was playing his first game as a pro, at his familiar second base and in Asheville. But this time, rather than the Bulldogs, the opponent was the Asheville Tourists. All Catamount baseball fans wish him well in the Braves organization. Eugene, OR - Former WCU standout Track & Field athelete Manteo Mitchell has advanced to the 400-meter final on the second day of the United States Olympic Trials. The top eight from Saturday's semifinal will compete in the finals, with Mitchell finishing with the sixth best time. As one of the top eight runners, Manteo has already qualified for the pool to be selected to run on the U.S. 4x400-meter relay team in the 2012 Olympic Games. He also has a shot at becoming one of three Americans who will represent the United States in the men's 400-meter dash (top three from the final will race for the U.S.). The finals are at 7:20 pm ET with television coverage on NBC from 7-8 pm on Sunday. Good Luck Manteo from the Catamount Nation. Cullowhee, NC - It's now 67 days until kickoff of Catamount football at Western Carolina's E.J. Whitmire Stadium. The Catamounts open the season on Thursday, August 30, 2012 against Mars Hill College. 2011 (Redshirt Sophomore): Played in six games as a reserve along the offensive front and on special teams. 2010 (Redshirt Freshman): Saw action in one game in his first collegiate season, making his debut in a home game against Chattanooga. Prior to Western: Was a four-year letter winner, three-year starter and two-time All Northwestern 4-A Conference selection on the offensive line for head coach Mike Biggerstaff at East Burke HS ... As a senior, earned East Burke's "Best Blocker Award," after grading out to a 87.5-percent with 15 pancake blocks ... Garnered second team All-Piedmont accolades his junior season helping guide EBHS to a school-record 12 wins ... Also lettered in track & field as a junior. Personal: Full name is Matthew Edward Hastings ... Is the son of the late Joel Hastings and Sarah Hoyle ... Has two older siblings; Adam, who was a three-year letter winner at The Citadel where he was named to the Southern Conference Academic Honor Roll; and Anna who is a senior women's golfer at USC Upstate. Franklin senior Lindsay Simpson, North Carolina's high school athlete of the year. Eugene, OR - Former Catamount track & field runner Manteo Mitchell competed in the 400-meter dash on the first day of the United States Olympic Trials on the campus of the University of Oregon. Mitchell ran in 3d heat, winning with a time of 45.70. Mitchell ran the ninth fastest time overall and will advance with the other top 15 runners to the next round on Saturday. Cullowhee, NC - It's now 68 days until kickoff of Catamount football at Western Carolina's E.J. Whitmire Stadium. The Catamounts open the season on Thursday, August 30, 2012 against Mars Hill College. To help pass those long summer days until football season starts, and hopefully get the Catamount faithful more excited about the upcoming season, we'll continue the 100 day football countdown. Today we'll continue to highlight the offensive line. 2011 (Freshman): Redshirted ... Twice named the offensive scout team player of the week, doing so following both the season-opener at Georgia Tech and again after the Wofford game. Prior to Western Carolina: Played on the varsity squad all four seasons at a variety of positions including tight end, long snapper, offensive tackle and defensive end ... Earned all-conference accolades as a senior as an offensive tackle. Personal: Last name is pronounced "MOBB-lee" ... Intends to major in mathematics. Eugene, OR - Former Catamount Manteo Mitchell heads to Eugene, OR, to compete in the 2012 Olympic Trials held at the University of Oregon on Friday at 6:10 pm ET. Mitchell will participate in the 400-meter dash. The first round of the 400m consists of 28 athletes, and the top 16 will advance to Saturday’s second round (8 pm ET). The top eight from Saturday will run in Sunday’s final to be held at 7:20 pm. The top three in the finals will represent the US in the 400-meter dash. The top eight comprise the initial relay pool for the 4x400-meter relay in the 2012 Olympics. Cullowhee, NC - It's now 69 days until kickoff of Catamount football at Western Carolina's E.J. Whitmire Stadium. The Catamounts open the season on Thursday, August 30, 2012 against Mars Hill College. To help pass those long summer days until football season starts, and hopefully get the Catamount faithful more excited about the upcoming season, we'll continue the 100 day football countdown. #69 not currently assigned, so we'll highlight another Assistant Coach. Steve Sisa (pronounced SEE-suh) joined head coach Mark Speir's staff in mid-February, 2012. He came to Cullowhee after spending the past two years on staff at the University of North Carolina in Chapel Hill, most recently working with the Tar Heel safeties. At WCU, Sisa will work with the Catamount defensive secondary including defensive backs and safeties. "We are extremely excited to get Steve Sisa on board here at Western Carolina. He brings a great wealth of knowledge and experience of defensive secondary play to our program," said Speir. "He has been a part of a high profile university like North Carolina, as well as, a blue-collared program like Southern Mississippi. He is a bright young secondary coach that will be a great teacher for our players and an asset to our University." Sisa made the move to North Carolina in 2010 to work in player development with the UNC football program. He was promoted by interim head coach Everett Withers to safeties coach before the start of the 2011 season, helping guide UNC to the AdvoCare V100 Independence Bowl in Shreveport, La. Under Sisa's tutelage last year, the Tar Heel safeties accounted for six of North Carolina's 14 interceptions and forced five of the 13 fumbles on the year. Sophomore safety Tre Boston picked off three passes with two fumble recoveries and five passes defended while junior Gene Robinson and senior Matt Merletti - who tallied a pair of interceptions against Virginia - both forced a pair of fumbles apiece in 2011. Prior to North Carolina, Sisa served two seasons (2008-09) as a graduate assistant at Southern Mississippi with the Golden Eagles making back-to-back appearances in the New Orleans Bowl during his tenure. Sisa helped tutor the Southern Miss secondary under defensive coordinator Todd Bradford and head coach Larry Fedora. He was also responsible for opponent scouting reports, scout team film study and practice scripts. A native of Manassas, Va., Sisa got his start at the collegiate ranks as a quality control coach at the University of Illinois in 2007 where he worked primarily with the team's linebackers. Illinois was 9-3 that season and advanced to the Rose Bowl for the first time since 1984. A linebacker at perennial Division III power Bridgewater College in Bridgewater, Va., in 1997, Sisa's career was cut short by a shoulder injury. He transferred to Virginia Tech where he earned a bachelor's degree in political science in 2001. He received a master's degree in sports management in 2009 from Southern Miss. Following his graduation from Virginia Tech, Sisa began his coaching career at Ed White High School in Jacksonville, Fla., under head coach Dan Disch, previously the defensive coordinator at Southern Miss and now at North Carolina. Sisa worked as the secondary coach in 2003 and the defensive coordinator from 2004-06. He additionally served as the team's NCAA recruiting liaison for prospective student-athletes and also was the Shrine Bowl defensive coordinator in 2006. Sisa is married to the former Lisa Taylor of Jacksonville, Fla., who is a school teacher in Durham. The Catamounts have offered Asheville High's lineman Jesse Karnezis. The Asheville High School incoming senior plays center and is 6'2", and weighs 259 lbs. He is an All-Mountain Athletic Conference selection as well as, an All-WNC player. Up to this point, Karnezis also has an offer from the Big South's Liberty. Watch highlights of Jesse here. It's now 70 days until kickoff of Catamount football at Western Carolina's E.J. Whitmire Stadium. The Catamounts open the season on Thursday, August 30, 2012 against Mars Hill College. #70 not currently assigned, so we'll highlight another Assistant Coach. Pat Mills joined the Catamount football staff in January of 2012, coming to Cullowhee after spending the 2011 season as the tight ends coach at Concord University in Athens, W.Va., a role he will continue at Western Carolina. Last season, Mills mentored Concord senior tight end Rashid Baker who finished the season ranked third on the team with 32 receptions for 315 yards and two touchdowns. Baker earned honorable mention on the West Virginia Intercollegiate Athletic Conference (WVIAC) post-season award squads. The Mountain Lions finished with a 7-4 overall record and a 7-1 mark in the WVIAC, claiming its first conference championship since 1990. Concord also qualified for the NCAA Super Region 1 playoffs, the program's first post-season appearance since 1992. It's now 71 days until kickoff of Catamount football at Western Carolina's E.J. Whitmire Stadium. The Catamounts open the season on Thursday, August 30, 2012 against Mars Hill College. To help pass those long summer days until football season starts, and hopefully get the Catamount faithful more excited about the upcoming season, we'll continue the 100 day football countdown. #71 not currently assigned, so we'll highlight an Assistant Coach. Mark Rhea came to Western Carolina in mid-March, 2010 as the defensive line coach and was promoted to the program's recruiting coordinator during the spring of 2011. Under new head coach Mark Speir, Rhea will continue to hold both positions entering the 2012 season. In his career, Rhea has mentored three players who have gone on to the professional ranks. In 2006, he coached J.P. Bekasiak, who later became a first-round pick of the Hamilton Tiger-Cats of the Canadian Football League. Rhea also coached two players at Idaho State who went on to the NFL in Jared Allen with the Minnesota Vikings and Jeff Charleston who played for the Super Bowl Champion New Orleans Saints last season. Allen, a two-time All-American and winner of the Buck Buchanan Award as the I-AA Defensive Player of the Year in 2003, was drafted in the fourth round by the NFL's Kansas City Chiefs in 2004. Charleston had 19 tackles for loss and was the Defensive Newcomer of the Year in the Big Sky in 2005. He signed as a free agent out of college with Houston in 2006. It's now 72 days until kickoff of Catamount football at Western Carolina's E.J. Whitmire Stadium. The Catamounts open the season on Thursday, August 30, 2012 against Mars Hill College. Prior to Western: Was a two-year varsity letter-winner at Edina HS for head coach Kim Nelson ... Helped Edina go 16-4 over his final two seasons as a prep, including a 10-1 record and conference championship as a junior ... Named All-Classic Lake Conference as a senior, while also tallying team "Best Offensive Lineman" accolades ... Achieved all-conference in baseball his senior year in high school ... Was also a starting right fielder on a team that took third in the state in American Legion baseball his junior year ... Additionally played basketball through his sophomore year of high school. It's now 73 days until kickoff of Catamount football at Western Carolina's E.J. Whitmire Stadium. The Catamounts open the season on Thursday, August 30, 2012 against Mars Hill College. 2011 (Redshirt Sophomore): Played in all 11 games making 10 starts along the offensive line at left tackle ... Helped freshman running back Shaun Warren rush for 200 yards and four touchdowns against Mars Hill ... Came on as a reserve in the Elon game ... Named to the 2011 Southern Conference Fall Academic All-Conference team. 2010 (Redshirt Freshman): Played in seven games including starting the first two games of his collegiate career ... Started at right tackle in the regular season opener at North Carolina State and at right guard at home against Tusculum ... Missed four games at mid-season both when WCU got upperclassmen starters back from injury and because of an ankle injury ... Returned to the lineup to play in the final five games of the season ... Named to the 2010 Southern Conference Fall Academic All-Conference team. 2009 (Freshman): Redshirted. Prior to Western: Played both ways and was the long snapper for head coach B.J. Laughter at Hendersonville HS, helping the Bearcats go 13-1 and advance to the state semifinals last season ... Was a four-year Academic All-Conference selection ... Listed as a two-star prospect by Rivals.com ... Earned All-Western Highlands Conference plaudits last season after grading out at 91-percent on blocking as a senior, while amassing 94 tackles including five sacks and three fumble recoveries on defense ... Was tabbed All-Area, All-State and was a Shrine Bowl Finalist, as well as first team All-Western North Carolina by the Asheville Citizen-Times ... Also played baseball as a prep, garnering all-conference accolades as a junior. Personal: Full name is Wesley James Cook ... Is the son of Mark and Leah Cook ... Has one younger sibling, Hailey ... His father played football at East Tennessee State, earning All-Southern Conference honors from the media as an offensive guard in 1986 ... His mother played collegiate volleyball at Maryville College in Maryville, Tenn. It's now 74 days until kickoff of Catamount football at Western Carolina's E.J. Whitmire Stadium. The Catamounts open the season on Thursday, August 30, 2012 against Mars Hill College. It's now 75 days until kickoff of Catamount football at Western Carolina's E.J. Whitmire Stadium. The Catamounts open the season on Thursday, August 30, 2012 against Mars Hill College. John Holt joined Mark Speir's coaching staff at Western Carolina in January of 2011. He will serve as the program's offensive line coach, coming to Cullowhee from his alma mater, Appalachian State, where he worked the four previous seasons. Holt spent three of his four years on staff at ASU working with the Mountaineer tight ends including coaching four-time All-SoCon selection Ben Jorden during three of his four all-conference seasons. Senior Ross Heffley and junior Preston Hatcher were both selected to the 2012 University Division All-State Baseball Team. The All State team consists of NCAA Division I student-athletes from North Carolina colleges and universities. Heffley completed the season with a .346 batting average, which included 22 extra base hits and a team-leading nine home runs at the plate. Heffley stole 16 bases in 18 attempts, while also drawing a team-high 35 walks against a team-low 14 strikeouts among the regular starters. Hatcher was selected as a relief pitcher. He finished the season with a 6-2 overall record and 10 saves, ranking second on WCU's single-season chart. Hatcher posted a 1.73 earned run average with 55 strikeouts through his 29 appearances and 52 innings pitched. Senior Erin Foster was selected to the 2012 University Division All-State Softball Team. The selection was made by the Collegiate Sports Information Association (NCCSIA). The All-State team consists of NCAA Division I student-athletes from North Carolina colleges and universities. Foster ended the season tied for second in the Southern Conference record books for homeruns in a single season with 18. She was also a two-time SoCon Player of the Week honoree and named Player of the Month for April. Erin was also a 2012 First Team All-Southern Conference selection. It's now 76 days until kickoff of Catamount football at Western Carolina's E.J. Whitmire Stadium. The Catamounts open the season on Thursday, August 30, 2012 against Mars Hill College. Prior to Western Carolina: Named the 2011 Mountain Valley Athletic Conference Defensive Player of the Year after recording 75 tackles including 19 for loss and six sacks ... Added four pass break-ups, forced two fumbles and blocked three kicks ... Was named All-MVAC on both sides of the football as a senior, leading Ashe County High to the school's ninth-consecutive state playoff berth ... Earned All-Northwestern Region accolades on offensive and defensive line - the only player to do so in the region ... Led the region in sacks ... Was a three-time all-conference selection, amassing over 279 career tackles ... Was a two-sport athlete at Ashe County High, adding an individual conference championship in wrestling ... Was a two-time state qualifier, placing one season ... Was twice named all-conference as a wrestler, recording over 125 career victories. It's now 77 days until kickoff of Catamount football at Western Carolina's E.J. Whitmire Stadium. The Catamounts open the season on Thursday, August 30, 2012 against Mars Hill College. 2011 (Redshirt Freshman): Played in 10 games with two appearances among the starting lineup ... Made his first career start in the season-opener at Georgia Tech, also starting the game against The Citadel ... Named to the 2011 Southern Conference Fall Academic All-Conference team. 2010 (Freshman): Did not see game action, taking a redshirt ... Earned the squad's offensive scout team player of the week honor prior to the season-opener at North Carolina State ... Suffered a shoulder injury during the season that required surgery to repair the torn cartilage. Prior to Western: Attended Hargrave Military Academy in Chatham, Va., after his prep career at Longmeadow HS ... Listed as a three-star prospect by Rivals.com, which also listed him as the 13th-best prep school prospect and the fifth-best offensive lineman in the group. High School: Was a two-sport student-athlete playing both football and basketball with a 3.5 grade point average in high school before attending Hargrave ... Was named first team All-Western Massachusetts and a Shrine Bowl starter in his senior season ... In three seasons on the varsity squad, helped his team post an unbeaten, 37-0, record ...Helped Longmeadow High to the boys basketball Western Massachusetts Championship as a senior. Personal: Is the son of Joseph and AnneMarie Polaski ... Was born in Springfield, Mass. ... Has two younger siblings in twins Miranda and Jessica. Today, the Colonial Athletic Association (CAA) added a one million dollar exit fee for its member schools wanting to leave the conference. I think this new exit fee (it was previously 250k) provides some insights into what direction the CAA is now headed, and the schools they will target. First, it solidifies the current CAA member' commitment to the conference and to FCS football. I don't see any current members that play football, now leaving for the FBS in the next 5 years, after having just voted in an extremely high exit fee. While, CAA Football has a separate charter from the CAA, and technically a school could look to move up in football and leave their other sports in the CAA, I just don't see any FBS conference inviting a FCS school to move up, and only bring football. I believe any FBS conference would want and demand all sports for such a move. Second, this new exit fee, combined with the approval of a revised revenue distribution plan that will allow schools to keep more of any earning from the NCAA basketball tournament, indicates to me a renewed emphasis on basketball vs football for the conference. What does this mean for the SoCon? First, I think it completely eliminates the possibility that either ASU or GSU would now consider the lateral move to the CAA, given their desire to move to FBS. However, any of the current SoCon football schools, that have no immediate plans to move up to FBS (such as Elon) may consider this option. The CAA certainly fits the footprint for the majority of Elon's student population. As for basketball only schools (Davidson, CoC, and UNCG) temptation may be hight, considering the renewed basketball emphasis of the CAA and 5 million dollars that VCU left on the table when they departed for the A-10 that will now be distributed to the CAA's membership. It's now 78 days until kickoff of Catamount football at Western Carolina's E.J. Whitmire Stadium. The Catamounts open the season on Thursday, August 30, 2012 against Mars Hill College. 2011 (Redshirt Junior): Appeared in all 11 games on the season, starting six times ... Made two starts at left guard early in the season before finishing the season with four-consecutive starts at right guard for the injured Teddy Rhoney ... Also saw time on special teams. 2010 (Redshirt-Sophomore): Played in all 11 games on the season with nine-straight starts at offensive right guard ... Made his first collegiate start in the road win at Gardner-Webb. 2009 (Redshirt-Freshman): Saw action in eight games, mostly along the offensive front and on special teams including field goal and PAT units. 2008 (Freshman): Did not see game action, taking a redshirt. Prior to Western: As a senior at Smoky Mountain, earned All-Mountain Athletic Conference and All-Western North Carolina accolades as a senior along the offensive line ... Garnered honorable mention all-conference plaudits as a junior. Personal: Is the son of Keith and Arlina Moore ... Has two younger siblings, Ragan and Connor. It's now 79 days until kickoff of Catamount football at Western Carolina's E.J. Whitmire Stadium. The Catamounts open the season on Thursday, August 30, 2012 against Mars Hill College. Today we'll highlight the offensive line. Mark your Calendars to Join Catamount Club members on Saturday, August 11th for our annual Tailgate Kick-Off, Catamount 101, & Football Scrimmage. The Catamount Club will be hosting a cookout while we coordinate the parking selections for the 2012 football season. In addition, you will be able to catch a glimpse of the 2012 Catamount Football Team while they are scrimmaging in the afternoon. Please RSVP with the Catamount Club office at 828-227-3047 or jfisher1@wcu.edu. Thank you for your continued support of WCU Athletics! GO CATS! It's now 80 days until kickoff of Catamount football at Western Carolina's E.J. Whitmire Stadium. The Catamounts open the season on Thursday, August 30, 2012 against Mars Hill College. Today we'll continue to highlight tight ends. 2011 (Redshirt Freshman): Sat out due to NCAA transfer rules. Prior to Western Carolina: Attended New Mexico State out of high school where he took a redshirt in the 2010 season prior to transferring to WCU; At Dudley HS: Played tight end as a prep, winning the state championship in football in 2007 & 2008 ... Recorded nine catches for 97 yards his senior year. t's now 81 days until kickoff of Catamount football at Western Carolina's E.J. Whitmire Stadium. The Catamounts open the season on Thursday, August 30, 2012 against Mars Hill College. It's now 82 days until kickoff of Catamount football at Western Carolina's E.J. Whitmire Stadium. The Catamounts open the season on Thursday, August 30, 2012 against Mars Hill College. Trey Elder joined the Catamount football coaching staff under head coach Mark Speir in January of 2011 from Appalachian State. Elder will coach the WCU wide receivers, a position he held at ASU for two seasons prior to the move. Elder, a four-year letter winner at quarterback from 2004-07, returned to his alma mater in 2010 as the wide receivers coach. In his first season on staff, he coached a trio of receivers - Matt Cline, CoCo Hillary and Brian Quick - that rank among ASU's all-time top 10 in receptions and receiving yards. Quick was a two-time All-American, earning his second honor under Elder after leading the Mountaineer receivers with 71 receptions for 1,096 yards and 11 touchdowns in 2011. Elder's coaching experience also includes one season at his high school alma mater, Byrnes High in Duncan, S.C., where he served as the wide receivers coach in 2009. He helped lead the Rebels to a 13-2 record and an appearance in the South Carolina 4A Division I state championship game. Under Elder's tutelage, Byrnes' receivers caught 284 passes for 4,655 yards and 60 touchdowns in '09. Elder, who was South Carolina's Mr. Football as a senior at Byrnes HS in 2003, began his coaching career as a student assistant at ASU in 2008. A 2008 graduate of Appalachian State, Elder spent much of his career backing up the two greatest signal-callers in Mountaineer history -- Richie Williams and Armanti Edwards. However, he excelled when given the opportunity, posting a 7-1 career record as a starter. He helped lead the Mountaineers to their third-straight national championship by going 4-0 as a starter in 2007 and played an integral part in the Apps' first national title in 2005, when he replaced an injured Williams early in the national semifinals versus Furman and led Appalachian to a 29-23 come-from-behind victory. Will the Cats return to Purple Helmets this year? 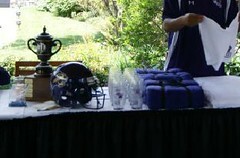 This purple helmet was on display Thursday at the Catamount Football Classic Golf Tournament in Maggie Valley. Does it indicate a return to the traditional purple helmets? If so, why not the traditional Bob Water's "The Cats" on the side? It's now 83 days until kickoff of Catamount football at Western Carolina's E.J. Whitmire Stadium. The Catamounts open the season on Thursday, August 30, 2012 against Mars Hill College. Starting this summer, the NCAA will now allow college basketball coaches to work with their players for up to two (2) hours per week. Of course there are academic requirements for the players participating, but if they are on campus, enrolled in summer school and working with the coaches, the hope is, graduation rates will improve. How the time now allowed with players is used, is up to the individual choice of the coach. The biggest worry about this new rule is that player may "burn out". However, that is probably doubtful, as serious players have been attending camps and working with personal trainers in the off-season anyway. What is needed now, is the funds to bring the players to campus for summer school. Another reason to step up Catamount fans, and join or upgrade your membership in the Catamount Club. It's now 84 days until kickoff of Catamount football at Western Carolina's E.J. Whitmire Stadium. The Catamounts open the season on Thursday, August 30, 2012 against Mars Hill College. 2011 (Redshirt Freshman): Saw action in two games near the end of the season, making his collegiate debut at nationally-ranked Appalachian State ... Made his first career reception against the archrival Mountaineers ... Named to WCU's Dean's List. 2010 (Freshman): Did not see game action, taking a redshirt ... Tabbed the squad's offensive scout team player of the week following the Tusculum game. Prior to Western: Played four seasons of prep football at both Dutch Fork HS before finishing his prep career at Ben Lippen High for head coach Reggie Shaw ... Was a Football Academic Honor Roll honoree at BLHS and received Academic Achievement awards from DFHS ... During his four-year career, accounted for 80 receptions for 1,406 yards and 13 touchdowns ... Hauled in a career-best 30 passes as a senior for a career-high 541 yards ... Was named to the South Carolina squad in the North-South All-Star game ... Of the field, attended the 2009 South Carolina Boys State held at the Univ. of South Carolina during the summer of 2009. Personal: Is the son of Dwayne and Alexis Jenkins ... Has a younger brother, Anthony Jenkins ... Has ties to the SoCon as his first cousin, Josh Roseborough, is a defensive lineman at Wofford. It's now 85 days until kickoff of Catamount football at Western Carolina's E.J. Whitmire Stadium. The Catamounts open the season on Thursday, August 30, 2012 against Mars Hill College. 2011 (Junior): Did not see game action stemming from his back injury ... Worked with the WCU team film crew ... Named to WCU's Dean's List 2010 (Sophomore): Suffered an off-season back injury that sidelined him for the 2010 season. 2009 (Freshman): Played in eight games with two starts ... Made his first collegiate start at Samford ... Used primarily as a blocking TE in place of a fullback and on runs around the ends of the offensive line. Prior to Western: Was a four-year Scholar Athlete and a three-year varsity letter winner at Peachtree Ridge HS for head coach Bill Ballard ... Was named first team All-County and first team All-Region at tight end as a senior ... Was also named second team All-State by the Atlanta Journal Constitution ... Recorded 146 yards receiving and three TDs in his final season ... Played offensive tackle as a junior ... In his first season on varsity, played defensive end and special teams on the state championship team ... Was a two-year varsity letter winner in track & field, setting a school record in the shot put as a junior. Personal: Full name is James Conner Orr ... Is the son of Jim and Terri Orr ... Has an older sister, Lindsay Tarquinio. Freshman Jacob Hoyle was has been named to the Louisville Slugger Freshman All-America team by Collegiate Baseball Newspaper. Hoyle was selected as a designated hitter, and is a second team All-Southern Conference selection at the same position. In addition to those honors, he was named to the Southern Conference's All-Freshman team for the 2012 season. Hoyle batted .308 this season, with a .449 slugging percentage. His 57 hits includes 14 doubles and four home runs. He led the Catamounts with 45 runs driven in on the year. It's now 86 days until kickoff of Catamount football at Western Carolina's E.J. Whitmire Stadium. The Catamounts open the season on Thursday, August 30, 2012 against Mars Hill College. It's now 87 days until kickoff of Catamount football at Western Carolina's E.J. Whitmire Stadium. The Catamounts open the season on Thursday, August 30, 2012 against Mars Hill College. Today, we'll continue with Wide Receivers. 2010 (Freshman): Joined the WCU football team during 2010 spring drills ... Was named the squad's offensive scout team player of the week prior to the road win at The Citadel. Prior to Western Carolina: Earned All-MidEastern Conference football accolades as a senior ... Was additionally tabbed second team All-Area on offesne by the Star News out of Wilmington, N.C. ... Earned WWAY-TV's Play of the Week on Oct. 16 with an over-the-shoulder touchdown catch.